I have mixed feelings about the month of February. I mean sure, my birthday is in February, so that's usually pretty fun, but it's just so dreary sometimes, you know? On the other hand, it's so short! It's over so fast! But then again, that's a bad thing, too. Rent is due faster than you expect. March sneaks up on you. Here it is the two days before the end of February and I was all, oh, I've got time for my Gourmet Unbound post, it's only the 26th. HA! Not so. Luckily, I glanced at the calendar at 4:45 this afternoon and noticed the rapidly approaching deadline. I have lots of baking planned for the weekend, so I wanted to do something quick and easy from Gourmet for tonight's dinner. 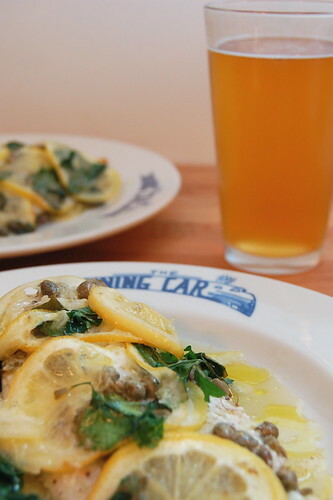 This oven poached fish in olive oil fit the bill. As is my wont, I tweaked a tiny bit. Mostly since it was just the two of us for dinner tonight, so I cut the original recipe in half. I didn't garnish with more parsley at the end (gasp! ), and I served the fish over a huge pile of spinach. And I do mean huge; we ate an entire 10 oz bag between us. You know that squidgy, frictiony feeling you get on your teeth after eating spinach or lemon? Big time. But worth it. This recipe is dead simple, the only thing is that it takes an hour for the fish to poach, so start it right when you get home from work. I waited until the fish was done, then sauteed a bag of spinach (washed, stems removed) in a few spoonfuls of oil from the fish pan. There will be plenty of leftover lemony, capery, fishy oil, when I come up with a way to use it in the next couple of days (salad dressing?) I'll let you know in the comments. 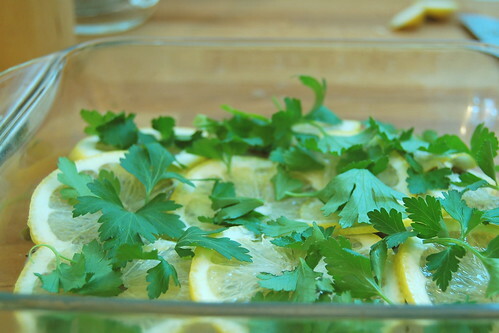 It's a layering game from the bottom up: start with the less attractive lemon slices (about half), then the fish, then salt and pepper, then capers, the pretty lemon slices and parsley. I wasn't sure whether to chop the parsley or not, but when it came out of the oven and a few of the parsley leaves were crispy from sitting up above the bath of olive oil. I see no problem with that at all. Don't be intimidated by the cup of olive oil. Very little of it sticks to the fish, so there's a ton left in the pan. 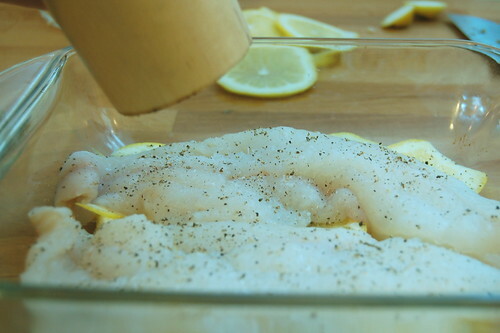 Pat fish dry, and let sit at room temperature for 10 minutes to take the chill off (say, while you slice the lemon). 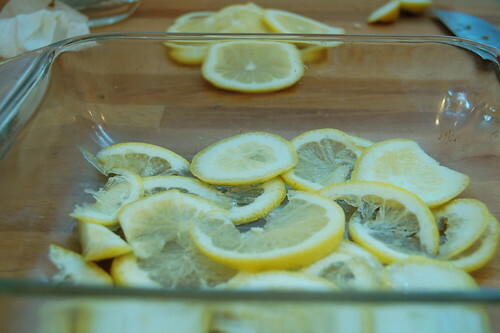 Line an 8x8 inch baking dish with the least attractive half of your lemon slices. 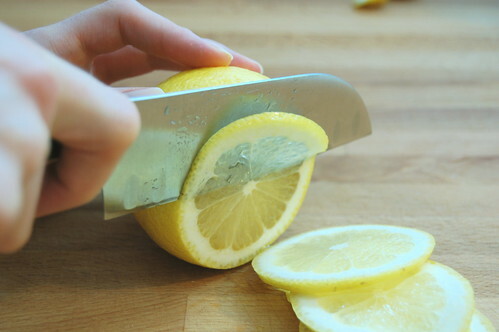 Lay the fish over the lemon slices. 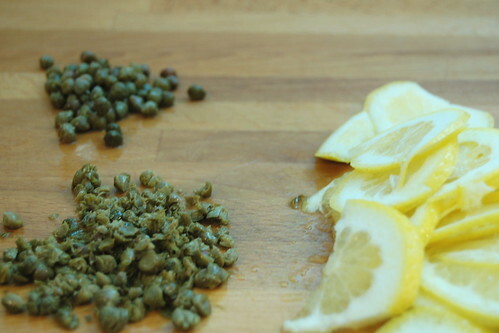 Coarsely chop half the capers, then mix them back in with the whole capers, and sprinkle them over the fish. 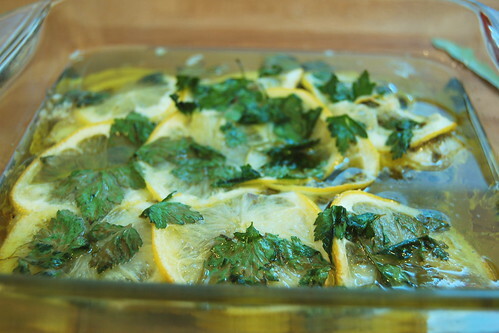 Top this with the prettier half of your lemon slices, then the capers, prettier lemons, and parsley. Stick it in the oven for an hour. If you're cooking 4 filets you may need an hour and fifteen minutes, but either way, cook it until the fish is flakey and cooked through. Ooh, I've always wanted to try olive-oil poached fish. Looks delicious.